Is the Championship race on? 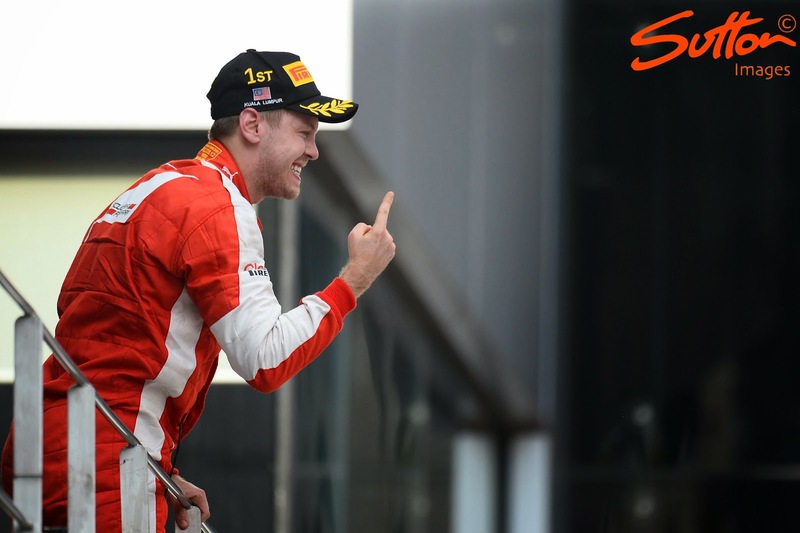 As Sebastian Vettel climbed atop the top step of the podium the thoughts of many around the world must now turn to a championship battle being ignited between Ferrari and Mercedes. Is it too soon to even contemplate such a turnaround from the Scuderia? First of all we must accept that Ferrari's pace in Australia has been vindicated, with a better performance in Malaysia and huge strides made in comparison to last years effort. The SF15-T is clearly a massive improvement, with the team fixing many of the fundamental issues that their cars have had in previous seasons. Plagued by issues with their own wind tunnel, they spent time using the Toyota facilities in Cologne whilst their own tunnel was refurbished. Having completed those refurbishments during 2014 this years car has predominantly been designed at Maranello, which structurally helps in terms of having all your people on site. Although the team have clearly made strides in terms of aero it would be unwise to play down the significance of the changes made mechanically, with the car is clearly more compliant too. In terms of the powerunit we've already established most of what the team changed going into 2015, which by-and-large rectified over complicated systems that the 2014 unit utilised. Aside from Ferrari's clear jump in performance we must also consider some of the outside factors that had an impact on the race too. Tyre degradation was clearly a factor that fell in favour of Ferrari's pace and although the signs were clear that this was one of their strong suits in Australia, it clearly came to the fore in Malaysia. Lest we forget that James Allison's Lotus designed cars also featured this trait and so it'll be interesting to see if this carries on throughout the season. The factor we must consider is the tyres operating temperatures, as with a high track temperature getting the tyres to work effectively within their window can cause some head scratching moments. It would appear that Ferrari were working close to the optimum as they had good pace and longevity, whilst Mercedes stint lengths and pace suggest they were struggling but only in comparison to Ferrari. A common theme of Mercedes pre 2014 was their over working of the tyres causing higher than average degradation. Whilst Malaysia perhaps offered an isolated temperature variant it is something that in terms of strategy they'll have to consider when fighting with Ferrari. Ferrari clearly won the battle of minds too, with their determination to stay out during the early safety car period paying dividends. Mercedes had also painted themselves into a corner strategically during qualifying, with the team using a set of the option (medium) tyres in Q1, whilst Ferrari saved a set. This played into Ferrari's hands during the race as that additonal set allowed them to run a Option-Option-Prime combination with Vettel, whilst Hamilton was forced to go Option-Prime-Prime. Strategy and pit stops will become a crucial battle ground going forward if the team are to take the fight to Mercedes. I'm trying my best to remain optimistic for the rest of the season and hope that Ferrari can continue to battle with Mercedes going forward, however, I'm also trying to retain some perspective on just how far a leap that has been for Ferrari. Surely we are just looking at a perfect storm of conditions? Nonetheless Ferrari should be buoyed by this and they'll undoubtedly continue to push hard for the next race in China. For the sake of F1 let's hope that the others can catch up as well. The closer the cars are, the better and exciting it will be for eveyone who takes an interest in motorracing. Tyres sure are also a major factor, but then again it is up to the teams and their respective drivers to extract the best out of them, given the exising circumstances. Perfect example of that is the 17 year old kiddo, who in mutual consent with his engineer, Xevi made decisions that paid off. An ever so often forgotten but contributing factor is that, passion and good atmosphere, brings the best out of people. Look at the comments about Seb and the prancing horse getting on so well! Furthermore the + results for the Renault guys will also contribute to re-establish the good vibes they had together with RBR in the past and will hopefully result in +++. Quarreling is negative and rarely leads to improving the spirit and good results. Sorry not very technical comment, but IMHO ever so true. Is there any truth in the story that Ferrari built their wind tunnel at a 45deg angle so they could call it art and sidestep planning permissions (how Italian..) which then caused the majority of their correlation/development issues? It's a fun story, and the wind tunnel was certainly... different. 45 degs... Yes its true. The original flat windtunnel was designed by Willem Toet , but at the last minute was re-done by Monty. Willem explains the story on Peter Windsors "the flying lap" no9 at 11mins onward. Matt is there any way you can do a piece on tyres? I am interested to know what made the Ferrari so good in Malaysia and why their car is so much kinder on it's feet, why the heat made such a big differecnce, etc. I understand the pace was 'tyre limited' but a bit more incite into what this is and how the cars are affected would be great. thanks! It should be about the technical behaviour of every compound for the race, and subsequently see with the race-engineer that every driver has, to make the best choice, given the circumstances in which the driver is during the race, but also what they found out during free practice.. Therefore the driver can, up to a certain degree, make the best option. Perfect example is Max together with Xevi, during the races they had this season! See also the way they did the testing in FP1, 2 and 3. It is not about making the best times, but try to understand the behaviour of all compounds that are available for every race!